Who wants to be on Santa’s “nice” list? We sure do! That’s why, when Santa came flying into town to do some work recently, and he asked to try out a Compass Card, we could hardly say no. We gave him a card, told him the basics, answered his questions, and had him tap, tap, tap away as he travelled on buses, on SkyTrains, on the WCE, to the end of the SeaBus, over at the North Shore. Here’s what he said about the card. 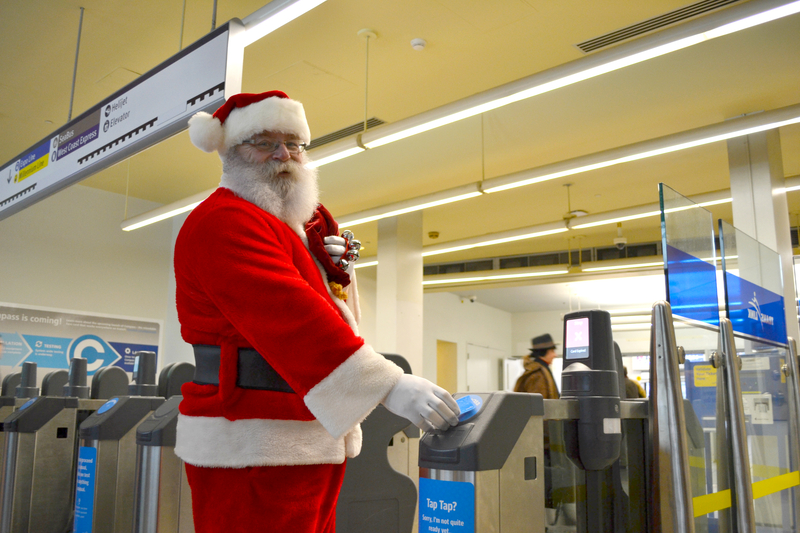 Buzzer: So, Santa, what do you think of the Compass Card? Santa: Ho, ho, ho! Well, I think it’s just jolly fabulous! It’s really easy to use and, since I’m only in town for a few days in December and a couple of weeks of vacation in the summer, I like that I can load it up with Stored Value and use it when I want—it’s the gift that keeps on giving. Buzzer: What about your elves, do you think they’ll use it? Santa: Well, my elves don’t always come with me, but when they do, they have lots of running around to do, picking up toy-making supplies and tools and whatnot. It’ll probably make more sense to put a DayPass on the card for them. Santa: Well, Mrs. Claus likes to come with me in the summer, but she usually stays for the whole month while I head back to the North Pole. She’ll probably get a Monthly Pass on her card when she comes so she can come and go as much as she likes. Buzzer: I’ve heard your elves can be somewhat mischievous; do you worry about them losing their cards? Santa: Ho, ho, ho! That’s true! They’re always pulling pranks and up to something. They certainly keep things interesting—and it wouldn’t be the first time they lost something. Buzzer: I hear you. Well, if they register the cards, they’ll get Balance Protection, just in case. Buzzer: What are you looking forward to about the Compass Card? Santa: Well, the elves have been trying to get me using the computer the last few years. Being way up at the North Pole, I’m looking forward to firing up the the ol’ machine and poking around on the website. I hear I’ll be able to load passes and Stored Value on my cards from there? Buzzer: Yep. That’s right. Do you have any questions for us? Santa: Just one: do the reindeer need cards too? Buzzer: Sorry, Santa. There’s no reindeer allowed on transit. Santa: Oh well. Thanks so much for letting me try it out. Ho, ho, ho!